Mix Crawfish Julie sauce with equal part pasta (rotini, shells, or bowtie are recommended). Stuff grilled eggplant or zucchini with seafood stuffing and top with Crawfish Julie sauce. Top fried green tomatoes, fried eggplant, or crab cakes with Crawfish Julie sauce. Eggs Benedict - Top an English muffin, biscuit, or bagel with poached eggs and Canadian bacon (or ham) & top with Crawfish Julie sauce. Gourmet Quiches - mix Crawfish Julie Sauce with eggs, asparagus, sliced carrots, & Swiss cheese (or cheddar), & bake in pastry shell. Grill or charbroil oysters and top with Crawfish Julie sauce. Grill or sauté chicken breasts with artichoke hearts and/or asparagus tips and top with Crawfish Julie sauce. Fill omelet with shrimp Etouffeé or shrimp Creole. Garnish omelet with green onions & shredded cheddar cheese. Serve with grits & a biscuit or English muffin. Prepare grits with whole milk & sharp cheddar cheese (Monterey Jack may be substituted). Top grits with a generous portion of Dr. Gumbo’s Shrimp Etouffeé. Serve with French bread. Thaw & Proof Pizza Dough. 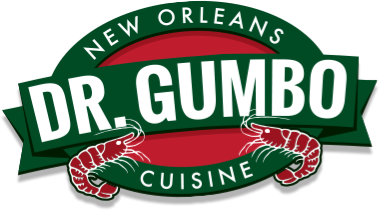 Spread a generous amount of Dr. Gumbo’s Shrimp Creole over the dough. Add thinly sliced fresh onions, bell peppers, & black olives. Cover with sliced Smoked Gouda cheese & shredded Parmesan. Fill omelet with shrimp Etouffée or shrimp Creole. Garnish omelet with green onions & shredded cheddar cheese. Serve with grits & a biscuit or English muffin. Add chicken, shrimp, crabmeat, pork, or beef to Orleans Sauce & serve over your favorite pasta. Top an English muffin with poached eggs and crabmeat and finish off with Dr. Gumbo’s Orleans Sauce. Layer grilled eggplant with seafood stuffing and finish off with Orleans Sauce. Boil artichokes until tender then stir in olive oil and grill. Serve with Orleans Sauce for dipping. Top crab cakes with Orleans Sauce. Mix crabmeat and asparagus tips in Orleans Sauce and top a grilled or sautéed chicken breast. Top grilled salmon with Orleans Sauce & lump crabmeat. Top redfish, snapper, or trout with Orleans Sauce & baby shrimp. Sautee fresh zucchini & squash with Orleans Sauce. Mix artichoke hearts & capers with Orleans Sauce and top chicken or pork chops. Use as a soup base and add your favorite vegetables and protein. Top panéed veal cutlets with Orleans Sauce. Top grilled beef or pork tenderloin medallions with Orleans Sauce and lump crabmeat. Mix black beans with smoked chicken, shredded cheddar & Monterey Jack cheese. Top with sour cream. Serve warm with tortilla chips. Layer black beans on thin pizza crust. Top with roasted chicken, fresh cilantro, jalapenos, tomatoes, sour cream, & mozzarella cheese. Wrap black beans in a flour tortilla with Monterey Jack cheese, tomatoes, shredded carrots, fresh spinach, red onions, & sour cream. Dip in salsa.